The NIGHTSEA Model SFA Stereo Microscope Fluorescence Adapter can turn your routine laboratory stereo microscope into a valuable tool for pre-screening your sample preparations for fluorescence before moving on to higher resolution systems. 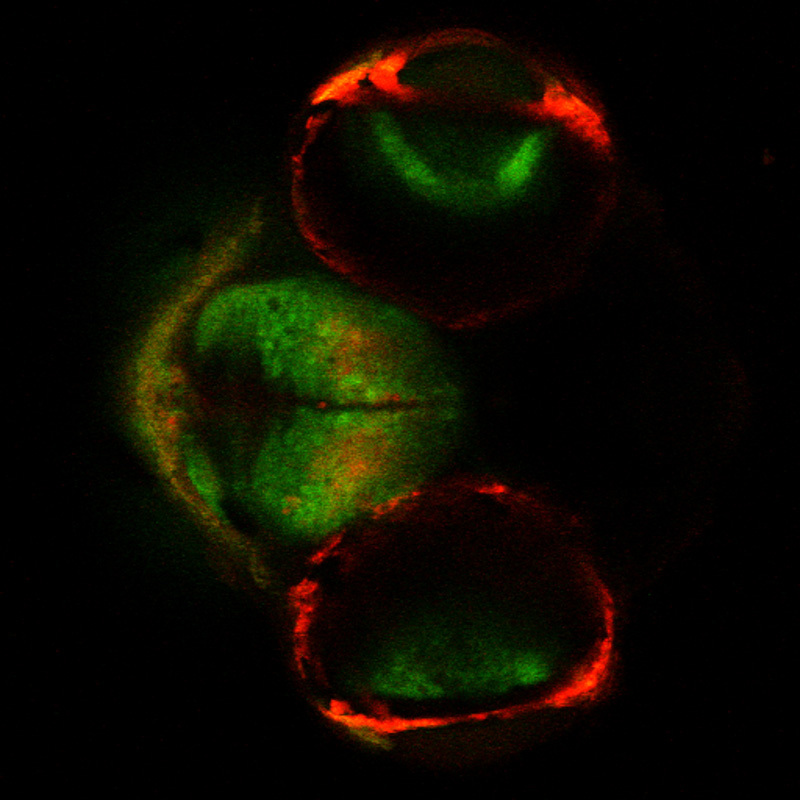 High resolution imaging of biological samples is heavily based on fluorescence techniques. Confocal, 2-photon, and high resolution compound fluorescence microscopes are almost always a limited resource. They are often located only in imaging core facilities and accessible on a scheduled, pay-per-use basis. The processes for introducing fluorophores to specimens are not always successful. Staining, introduction of GFP-bearing plasmids to cells, immunohistochemistry – all are fallible. It is not unusual to spend time searching for fluorescence on a high end system when there is not even any there to be found. The NIGHTSEA SFA enables fluorescence pre-screening of specimens on a standard stereo microscope. The detail that you see is not important – the simple presence or absence and general location of fluorescence lets you know whether it is worth taking your specimen to the imaging core. Between the direct expense of the use fee and the time wasted to look at a non-fluorescent specimen it will not take many saved trips for the NIGHTSEA system to more than pay for itself. Rabbit psoas muscle fibers stained with Alexa Fluor 488 Phalloidin, in white light and fluorescence. Images made using NIGHTSEA’s white LED (left) and the Royal Blue excitation/emission light+filter set. Samples courtesy of Dr. Beth Brainerd and Natividad Chen, Brown University. Download the application note in pdf format.